The full form of TENS is Transcutaneous Electrical Nerve Stimulation. You may be wondering as to what is a 10s unit? TENS machines are used as pain relievers. Based on the condition and state of patients, it can be used from 30 minutes to up to 2 hours. It is portable and battery operated. Wires from TENS machine are connected to sticky pads that are attached to the body. Electrical pulses in small amounts are sent through the electrodes into the body. Those pulses will make block the pain signals that are on their way to the brain. As the brain is not receiving the pain signals, patients cannot feel pain for that moment of time. There is no complexity as we are momentarily blocking the pain signals. But it is essential to consider the product quality and durability before buying tenz machines. After thorough research, we have figured out the top five TENS Units in the market. 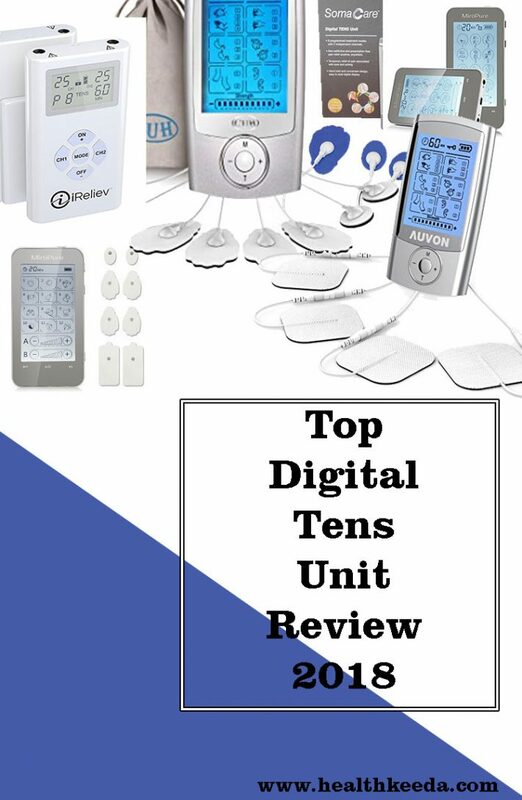 Options are customizable in this digital TENS Unit. It consists of 2 channels and 8 different modes. 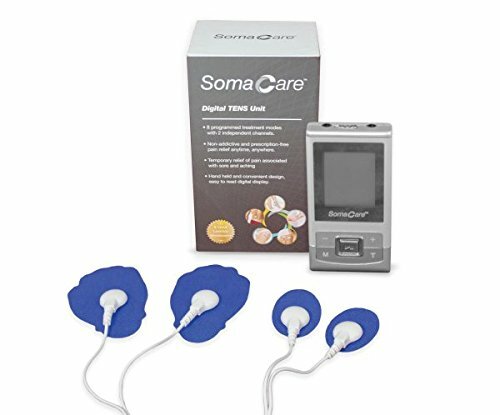 Soma Care Digital TENS Unit comes with an adjustable pulse. The package includes a Digital TENS device, charger, 1 USB, four conductive Gel-pad electrodes along with connecting leads. Users can choose different modes based on the condition, and it acts effectively on acute and chronic pains. This product is fully equipped with lots of features to treat the pain in areas of Knee, Shoulders, ankles, wrist, back and elbow. 2 small, 2 large and 4 medium pads are provided and you can choose the size based on the pain areas. 12 modes and 20 levels of adjustable intensity give the power to users for relieving multiple pain areas at the same time. A rechargeable Lithium battery is used in this tenz machine. Design in USA, patent pending, all intellectual property rights reserved by Healthmate International, LLC. Design background: When 2013 version Pro-8AB and 2014 version Pro-8AB10M were brought to the market, they have been hot sales, won appraise from customers, but customers still demand it with two separated channels and touch screen fast selecting mode, timer, AB channel, lock, now we are the first to launch Touch Screen TENS unit T12AB. New Features and functions: - 12 modes. choose your favorite mode in either output A or output B; 12 modes and intensity are separately controlled in output A and output B. Large LCD display with back light; better view of the screen especially at night or in the dark light. 80 minutes timer setting - Stainless steel shell with engraved HealthmateForever brand logo. Users take time to get an understanding of controls on this device as there are many options on the screen. But once known, there is no seeing back. Pre-programmed modes are a special focus in this Unit. Body Building, Cupping, Scraping, Acupuncture, and Tuina are some of them. The lithium battery is used and gives a battery backup of up to 10 hours. Dual output, Adjustable timing, 20 levels of Adjustable Intensity are some of the features of CUH TENS Unit. 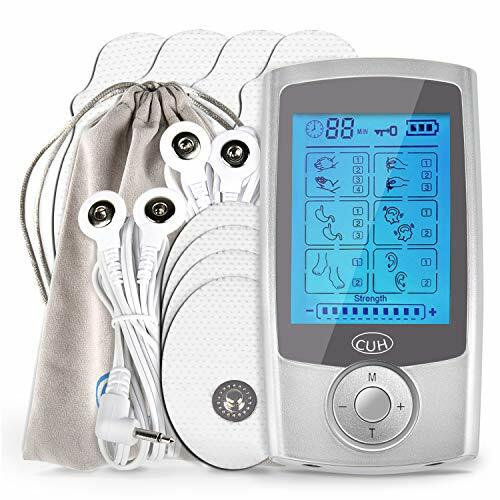 16 preprogrammed massage modes in a rectangle design: Tuina (4 modes), Abdominal Massage (3 modes), Foot Reflexology (2 modes), Acupuncture (3 modes), Head Massage (2 modes), and Ear Massage(2 modes). Rechargeable lithium battery-- 1 charging for up to 10 hours of use. This tens unit muscle stimulator can be connected to wall charger or computer USB port to charge. Pocket Size - Its Portable, Lightweight & Convenient design allows you to relax at any time! Anywhere! Used for back, knee, shoulder, ankles, wrist and elbow etc. The package includes Ireliev TENS device, 2 Lead wires, Tote Bag, Belt Clip Holster, 4 electrodes and 3 AAA Batteries. This bio TENS machine is in the size of a debit card. This machine is effective in relieving pain from aching muscles due to strain from physical activities, sports, etc. 3 AAA batteries gives an efficient battery backup of up to 15 hours. 25 intensity levels, 8 pre-set therapy modes provides more customization and comfort for users to choose based on their pain level. Dual Channel Capability: Up to 4 Electrodes for Large Pain Coverage or Multiple Body Parts. Control each channel independently. 8 Pre-Programmed Therapy Modes: P1 thru P8 is uniquely designed to treat your pain. Customize your therapy with our Pre-programmed modes that deal with both acute and chronic pain differently. This TENS stimulator relieves pain from all significant parts of the body including Neck, Shoulder, Arms, Hips, Thighs, Deltoid and Lower back. 16 pre-set massage modes with adjustable timing make it easier to operate. Lithium battery provided is rechargeable. It gives backup of 10 hours. This removes the hassle of changing batteries during the working of bio TENS machine on the body. 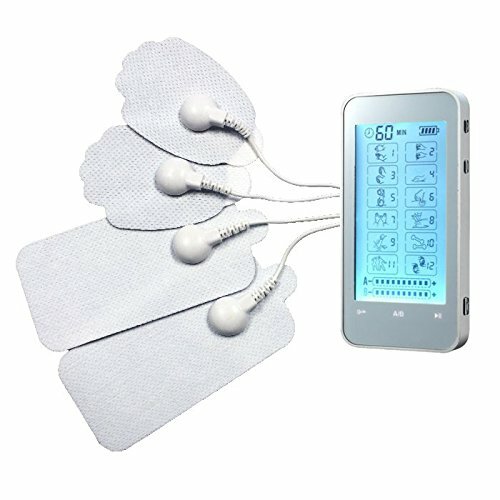 This product is one of the best TENS stimulator available in the market. UPGRADED TENS UNIT PADS. The Low impedance Solid Gel has been upgraded to the industry leading Japanese adhesive, which can provide much better self-stick performance and easy clean up after 20 to 30 uses for longer lifespan. Standard 2mm connector lead wires & electrodes are classic and commonly used in medical area, which makes it easier for you to find compatible accessories. 16 CHOICES FOR PAIN RELIEF. 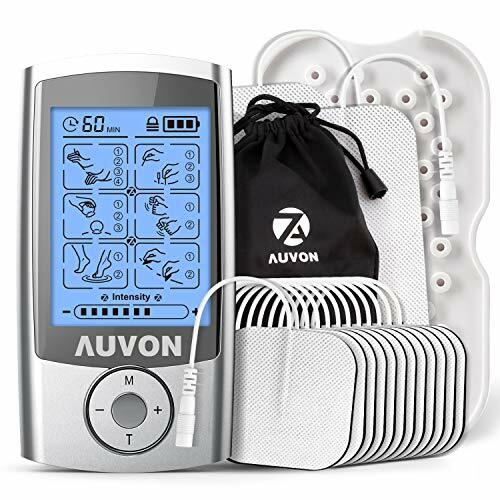 AUVON electronic TENS device has as many as 16 user-friendly pre-promgrammed massage modes and adjustable timing, making it much easier to use than other traditional electric therapy products which may need you to set the pulse frequency and duration of each pulse manually. There is no significant evidence that tenz machines give side effects to human body. But it is strictly advised to use TENS unit only if doctors suggest to. 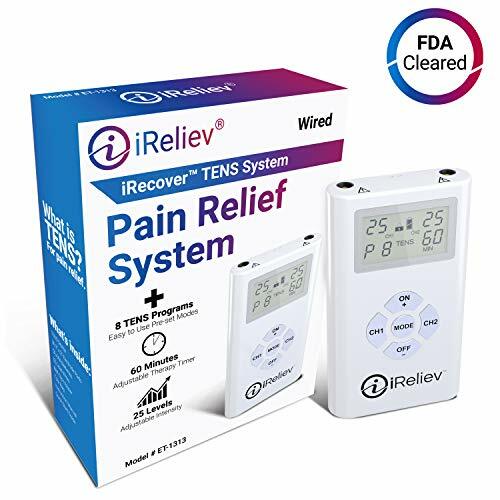 Momentary pain relief is the main advantage with a Digital TENS unit.